At the unearthly hour of 2:30am we take an Air Asia flight (the no-frills equivalent of EasyJet) to Kuala Lumpur. Difficult to sleep but we managed to grab a couple of hours. KL is Air Asia's headquarters so they have their own no-frills terminal which is quite simply an enormous hanger. It's a humid, slightly chaotic transfer, but soon we're on another flight to Kota Kinabalu (or KK as it's often called) in Borneo. It's funny, when I mentioned to Chinese colleagues that I was going to Borneo, nobody knew what I was talking about. Where? I think it's partly because it has a different name in Chinese but also it's an island not a country. In fact it's three countries: Indonesia, Malaysia and Brunei. Indonesia's bit, known as Kalimantan, makes up a good two-thirds of the island and is the least developed; Malaysia's part is split between Sarawak and Sabah; and then there's the tiny oil-rich principality of Brunei. I've always wanted to come here. Ever since pouring over maps of South East Asia as a child, reading about James Brook (the 'White Rajah'), whose family ruled Sarawak for 100 years, and Eric Hansen's Stranger in the Forest in which the author walks from the north to south coasts crossing some of the least explored territory in the world. 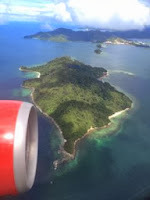 The flight hugs the coast, finally landing in KK where we are met and driven to a modest beach resort which will be our base for the next week.